Losing your cards isn't much fun. With that in mind, we've created a service for players that lose or damage their Netrunner cards. This crusade is designed to help reunite players with their lost cards by replacing them with minimal fuss or bother. If you've misplaced some of your cards or the dog has been mischievous, please contact us with all the relevant details and we will do our best to alleviate your woe! 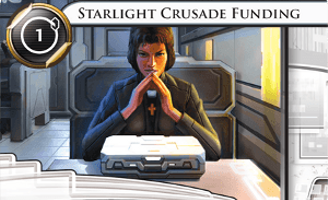 The Starlight Crusade functions on the contributions of kind and generous souls, of which there are thankfully many in the Netrunner community. Please donate if you're able and help fellow runners in their times of need! If you wish to donate to our Starlight Crusade fund, please contact starlightcrusade@netrunners.co.uk for more details. All donations, big or small are gratefully received!